Guttenplan’s Bakery was established by Jacob Guttenplan in 1908 in New York City. Always a baker by trade, Jacob immigrated to the United States from Austria in 1903 with his oldest son. In 1914 he, along with his family, relocated the bakery to the Jersey shore. 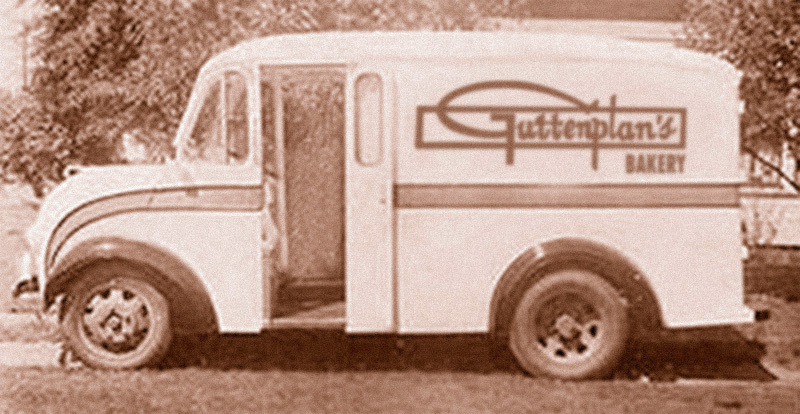 During those early days of Guttenplan’s history, the business consisted of a bakeshop on Mill Street in Long Branch, New Jersey, and a small retail outlet a few blocks away. Its only employees were Jacob himself and other family members. Eventually the business was passed to Jacob’s two sons, Irving and Hymie Guttenplan. Irving took over the management of the bakery during World War II, and after the war his brother Hymie joined him. Together they saw the business through more than three decades of successful growth with Irving’s wife Harriet serving as financial controller. In the 1920’s the first non-family employees were hired, and by 1935 the bakeshop and the retail store had been relocated a few miles away. The entire operation was moved to Third Avenue in 1955, combining the bakery and the retail shop. In 1980 a new branch was opened to provide a larger retail store and coffee shop, as well as a new location for cake production. In 1963, Irving and Hymie Guttenplan’s nephew, Abe Littenberg, joined the business, representing the third generation of family participation. In 1972 Irving retired and his son, Jack, joined the management of the bakery. Hymie retired in 1975 and sold his interest to Bill Smalls Sr. and Andy Rannertshauser, who at that time had a combined record of 30 years of service with the company. In 1978, Abe’s nephew, Eric Littenberg joined the business becoming the fourth generation of Frozen Dough Specialists. Eric learned the craft of baking working nights in the Long Branch facility before shifting to frozen dough production. He became an expert in all areas of the manufacturing process including mixing, packaging, and shipping & receiving. When the needs of the customers grew Eric became one of our first Technicians working directly with customers at their stores, and introducing them to the benefits of using frozen dough. In recent years, as greater emphasis was placed on food safety, Eric was asked to become the Food Safety Director. He was instrumental in the development of many of our Food Safety programs that are still in place today. During the early 1980s, longtime employee Irma Doerner, became the financial controller and subsequently became a shareholder. Bill Smalls, Sr. passed away in March of 1993, and Irma Doerner retired in March of 1996. Andy Rannertshauser passed away in December of 2013. From a company that in the 1950s served between 50 and 60 wholesale customers, Guttenplan’s soon grew to employ over 100 people and service over 300 wholesale customers throughout New Jersey and surrounding states. Its’ first sales outlets included supermarkets, schools, delicatessens, and restaurants, as well as a large number of retail customers. In the 1960’s Guttenplan’s perfected a procedure for freezing unbaked dough for distribution to its retail shops and in 1964, the company began to sell frozen bread and roll dough to supermarkets around New Jersey. Frozen dough sales eventually became the focus of the business, and the name “Guttenplan’s Frozen Dough” was adopted. In 1990, the company developed a 12-acre site in Middletown exclusively for frozen dough production and divested itself of all other bakery operations. Since that time, Guttenplan’s has become one of the largest producers of frozen dough products in the nation. Recently Jack’s two sons, Adam and Aaron, joined the family business as the newest additions to the Guttenplan’s team. In June 2011, Adam started at Guttenplan’s and has quickly become a pivotal member of the team. Adam was instrumental in the development of a new soybean storage and filtration system aimed at enhancing oil quality, reducing delivery costs, and improving plant efficiency. Adam has also done a tremendous job developing our new all natural product formulations, and working with the manufacturing staff in order to make the necessary changes. In January of 2014, Jack’s youngest son, Aaron, came on board after graduating from college. During his time here, Aaron has mastered our new nutrition software which allows us to ensure reliable and accurate labeling of products. Aaron was also pivotal in developing and strengthening the company’s brand and website, which were overhauled in 2015. We at Guttenplan’s still believe that success lies in the personal satisfaction of each of our customers and employees. Our goal is to keep Guttenplan’s on the cutting edge of the frozen dough industry, while still maintaining the tradition of high quality products and customer service that made us successful. Attention to detail and pride in the goods produced assure continued growth and success in the years to come.